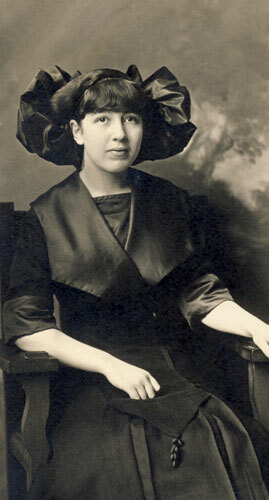 Hazel Bausman, daughter of Nicholas Jr. and Catherine (Hebenstreit) Bausman, and a sister of my great-grandmother, Viola (Bausman) Davis Hickman. Her other siblings were Gertrude, Clement, Pearl and Viola. Hazel died on November 20, 1929, in a car accident. Hazel is buried in Scales Mound Township Cemetery, Scales Mound, Illinois. While perusing some of my mom’s genealogy binders, I found this article that discusses the car accident and the inquest that followed. There was no citation, but it was probably published in the Galena paper. Miss Hazel Bausman of Scales Mound was in an auto accident that occurred on Route 5 four miles East of East Dubuque at about twelve fifteen Wednesday morning. The other occupants of the same care were Arthur Stephan of Scales Mound and Emmerson Houy and Miss Evelyn Stoewer of Galena. Mr. Stephan suffered a gash on one wrist but the other two were not injured. The coroner’s jury held an inquest at noon today in the Nash & Bertsch Funeral Chapel with William H. Nash coroner presiding. The only witnesses were Mr. Houy and Miss Stoewer, Mr. Stephan being unable to testify owing to the nervous reaction following the terrible accident. According to testimony Mr. Houy and Miss Stoewer had been spending the evening in East Dubuque and were returning to Galena. Mr. Stephan and Miss Bausman were offered a ride in the car driven by Miss Stoewer and owned by John Gill, as Mr. Stephan’s car was disabled and was left in East Dubuque for repairs. As they came around the curve on what is known as Sand Hill the lights of an oncoming car caused Miss Stoewer to lose control of the machine for a second and due to the slippery pavement and the blinding snow storm the machine, a Buick coach, swerved across the road to the left and down a steep embankment, tipping over. Miss Bausman suffered a fracture of the skull that probably caused her death instantly. After the accident Mr. Houy crawled out through a window then assisted Miss Stoewer out, after which she ran to the road and stopped a car in which she was taken to East Dubuque where Dr. U.S. Lewis was summoned. Upon arriving at the scene of the accident Dr. Lewis pronounced Miss Bausman dead. By that time the body had been removed from the car and was placed on the ground. The Coroner and Deputy Sheriffs Ehrler and Maeder and States Attorney Tear were on the ground in a short time. The car was considered damaged and was brought to Galena this morning. The body was brought to Nash & Bertsch Chapel where it was prepared for burial and later removed to the family home in Scales Mound. 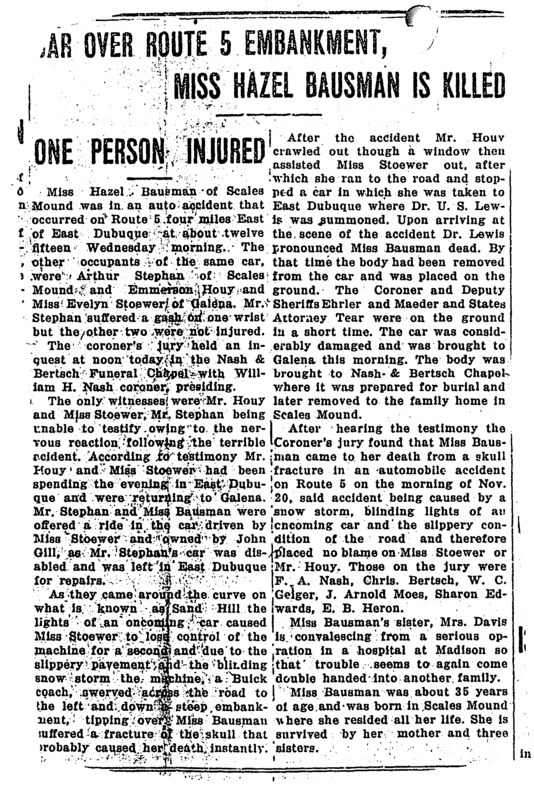 After hearing the testimony the Coroner’s jury found that Miss Bausman came to her death from a skull fracture in an automobile accident on Route 5 on the morning of Nov. 20, said accident being caused by a snow storm, blinding lights of an oncoming car and the slippery condition of the road and therefore placed no blame on Miss Stoewer or Mr. Houy. Those on the jury were F. A. Nash, Chris. Bertsch, W. C. Geiger, J. Arnold Moes, Sharon Edwards, E. B. Heron. Miss Bausman’s sister, Mrs. Davis is convalescing from a serious operation in a hospital at Madison so that trouble seems to again come double handed into another family. Miss Bausman was about 35 years of age and was born in Scales Mound where she resided all of her life. She is survived by her mother and three sisters.